Zermatt is car-free. Only electric vehicles are allowed in Zermatt. Private vehicles do not have access beyond Täsch (5 kilometres from Zermatt). The road between Täsch and Zermatt is blocked for public transportation. Täsch has car parks and public parking spaces. Shuttle trains depart from Täsch every 20 minutes. 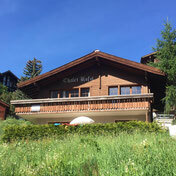 The Chalet Rofel is in 10 minutes of walking distance from the station. I recommend to take a taxi with a lot of baggage (e.g. Taxi Bolero, +41 27 966 60 60).